On Tuesday 26th June as headline sponsors alongside Thatcham Research, the Audatex Team attended the new Bodyshop Repair Industry Apprentice Awards (BRIAA’s) at the Ricoh Arena in Coventry where we celebrated the success of two of our talented apprentices! Launched this year and hosted by ABP, the fantastic event celebrated the importance of young talent and the value of apprenticeships to the body repair industry. Following lunch and networking in the exhibition area, the awards were given out. 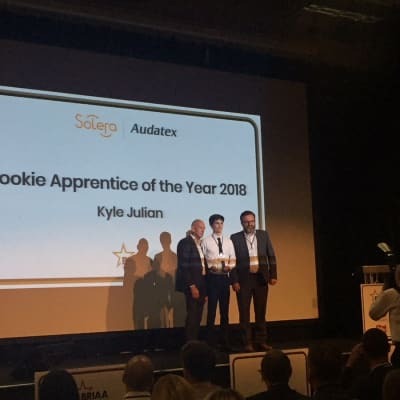 Our apprentice Kyle Julian won ‘Audatex Rookie Apprentice of the Year 2018’. Kyle joined in just October last year and was the first to join a commercial team. In his short amount of time at Audatex so far, he has shown impressive diligence to his work and the team, taking a high level of accountability for his work. He is friendly, approachable and always willing to help, all of which makes him a highly valued team player. 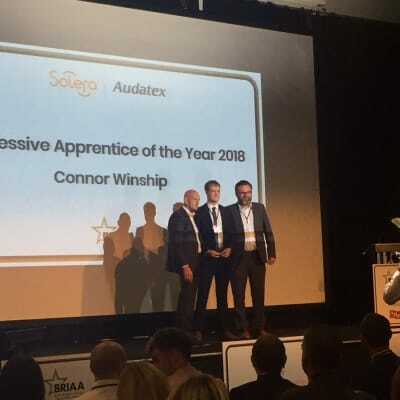 Our apprentice Connor Winship won ‘Audatex Progressive Apprentice of the Year 2018’. Connor has been with us for nearly two years now, having joined with our first ever intake of apprentices. He really has risen to the challenge of becoming a great developer. He excelled in test automation while learning the ropes, taking accountability for his work. He has continued to show great diligence in his work. He is friendly, approachable and always willing to help. An excellent team player. Congratulations again to Kyle and Connor on your award wins and keep up to good work!